Whether working on-site or in her studio, the pattern of light and shadow is the first thing that draws Katherine Simmons to a subject. The relationship of elements, quality of light, and color harmonies create a visual poetry that she seeks to express on canvas. “Every painting is a journey of discovery to capture a moment in time”, says Kathy. Known for her sensuous landscapes and soft brushwork, Kathy is inspired by American Masters such as Childe Hassam, William Merritt Chase, Dennis Miller Bunker, and John Singer Sargent. Katherine earned a Fine Arts Degree from the Massachusetts College of Art and Design, rounding out her formal training in master classes with oil painter Charles Sovek and pastelist Robert Scott Jackson. 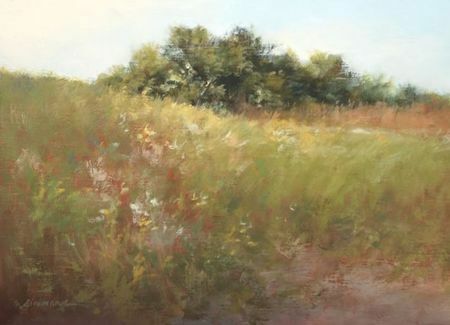 Her work has been featured in The Pastel Journal, American Artist Magazine, and Connecticut Magazine. She is pleased to be an Elected Artist Member of Lyme Art Association, the Connecticut Plein Air Painters Society, Connecticut Women Artists, Salmagundi Club, and Oil Painters of America. For more information about the artist go to: www.katherinesimmons.com.